The latest from Hana, Maui, 1877. On the 21st of July, that being Saturday, on that day, Uaiwa fought with Wahine, both of them being contract laborers; they live at Oloewa, Hana, and Uaiwa stabbed Wahine with a knife in the cheek, and the reason for their quarrel is not known. 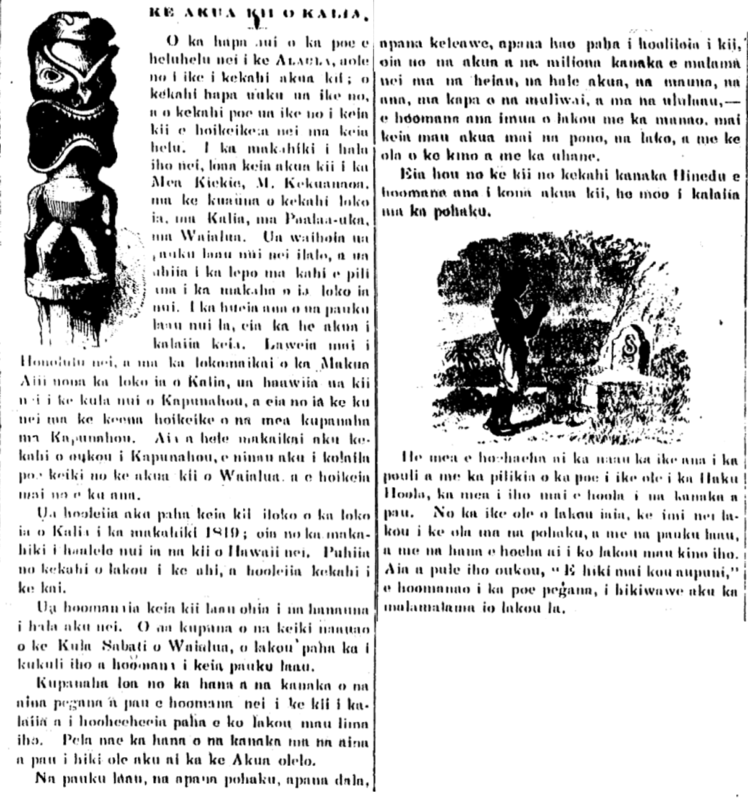 Wahine is an actual cousin of Uaiwa, and here yet his temper soon flared up [pii koke ke kai o Kaihulua] and he lost his senses. A fishing canoe pounded by a wave.—On Friday, the 3rd of August, Kekahawalu and his fishing canoe was hit by a wave right outside of Mokaenui and Makaalae. The canoe came ashore first carried by the waves, and as for Kekahawalu, he was pounded by the waves and escaped nearly dying; without receiving help from those on shore he would not have escaped. Some wooden idols [kii laau].—On the 15th of August, brought by Momoa were a couple of amazing wooden images, along with one gourd calabash [hokeo] and some cordage [aho aha], to the Catholic teachers in Puuiki; there it was displayed, and the two of them are caring for them until this day. These old things were found by Welo in a hidden cave, seaside of Pukuilua, which was revealed to him in a dream, and was shown to him. The kii are made in the shape of people. It is said that these kii were procreative gods of the olden days, and were hidden away during the time that the god images of Hawaii nei were being destroyed. These old things have been hidden for fifty or more years, and it is the first time these revered things of the dark ages are being seen again. L. K. N. Paahao. Ka Nupepa Kuokoa, Buke XVI, Helu 37, Aoao 3. Sepatemaba 15, 1877. 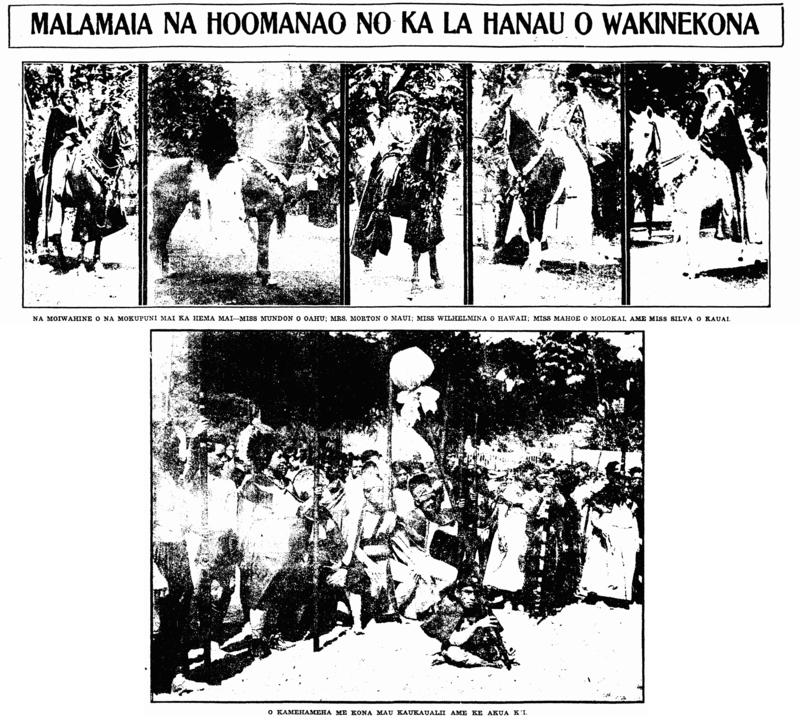 More on the reenactment of Kamehameha’s landing, etc. 1913. THE QUEENS OF THE ISLANDS FROM THE LEFT—MISS MUNDON OF OAHU; MRS. MORTON OF MAUI; MISS WILHELMINA OF HAWAII; MISS MAHOE OF MOLOKAI; AND MISS SILVA OF KAUAI. KAMEHAMEHA AND HIS KAUKAUALII AND THE IDOL GOD [AKUA KII]. Ka Nupepa Kuokoa, Buke LI, Helu 9, Aoao 1. Feberuari 28, 1913.